I've been teaching hand-to-hand combat for over 17 years, traveling the world and delivering instruction to thousands of students. Any good fighting program has a level of stress—rigors that push you to work harder, and do better. Typically, the rigors of training are a byproduct of fatigue and abuse—neither of which are safe or conducive to good learning. My clientele aren't able to use a training method that leaves them unable to execute their sworn duties, and training injuries are a massive professional risk. While we have used resistance and weights for conditioning, we needed a system that would allow us to introduce large-scale muscular effort without transitioning back and forth between training and the weight pile. Coupled with the fact that all of our training has student-to-student contact, traditional weights just weren't an option, and lead-bar arm weights were out, too. Ironwear's Flex-Metal is the only product we've found that fit the bill. That is… after exhausting every option in the marketplace, including our own prototyping cycle! The product development team has been absolutely invaluable. 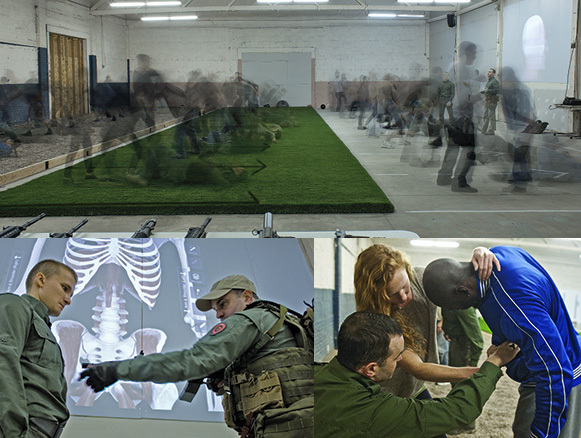 Our organization develops specialized training for law-enforcement and civilian clients. When we were challenged to find a weighted training system, no other product on the market came close. In fact, Ironwear was able to develop prototypes that fit our unique needs. Because we use Ironwear equipment at weights 2-3 times heavier than the average user, it was important that the product be form-fitting and minimize the bulkiness associated with wrist and leg weights. Additionally, we fight on concrete and gravel… so we're hell on equipment. The Ironwear line has held-up admirably. We don't recommend Ironwear. We use it!